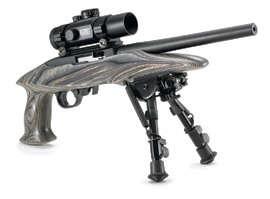 New rifles abounded at the 2008 Shooting Hunting and Outdoor Trade Show. But the reintroduction of an old favorite, the Winchester Model 70, stood out for me. Control-round feed and three-position safety are still there along with a new MOA Trigger and promised accuracy of under 1 inch at 100 yards. The industry, in general, is responding to our pleas for better triggers, as each of the major manufacturers’ new bolt rifles specifically touts an improved trigger. The Winchester Model 70 will be available in Super Grade, Featherweight Deluxe, Sporter Deluxe, and Extreme Weather Stainless Steel, each in several cartridges. It’s being built at the FN plant in North Carolina. Note the return to the original Winchester brand name, not U.S. Repeating Arms Co. The Winchester name still belongs to the Olin ammunition people, but they are licensing it to this rifle. Browning, which operates under parallel corporate ownership, also has a new bolt rifle, the X-Bolt. It, too, touts a new trigger, and a new bolt unlock button that is separate from but works with the thumb safety. Other features include 60-degree bolt lift, a detachable rotary magazine, and an Inflex recoil pad. Four screws lock down each segment of the scope mount base (eight total). Browning’s new take-down version (rotate one lever and it slides apart) of the BLR lever action is being chambered for 10 short-action and four long-action cartridges, and all can be had in either a straight or pistol grip stock. A new scope base that attaches directly to the barrel should do a good job of holding zero. Browning has also expanded their T-Bolt line with .17 rimfires and composite stocks. Marlin has reentered the bolt action arena with the XL-7. Offered in long-action cartridges, it’s still lightweight at 6-1/2 pounds and features an adjustable Pro-Fire trigger, a Soft-Tech recoil pad, and pillar-bedding in a synthetic stock. With the Marlin name and a suggested retail of $326, this one should sell itself. H&R is promoting a full-featured Topper trap gun, and their synthetic Handi-Rifle (with scope base) is now being offered in .357 and .44 Magnum, no doubt just in time for the new Hornady LeverEvolution longer-range ammo in these cartridges. Also new are Handi-Mag rifles in 7mm Remington and .300 Win Mag. Ruger is making new, lightweight Hawkeye rifles with 20-inch barrels, also just right for their latest collaboration with Hornady, the new .300 and .338 Ruger Compact Magnum cartridges. Ruger has a couple of new pistols, too. The SR9 is a slim, striker-fired (no visible hammer) lightweight 9mm. The .380 should fit in anyone’s pocket. I’ve always maintained that quality handguns have the potential for hunting accuracy if the shooter holds them steady, not at arm’s length but rather from a rest. To that end, Ruger is offering an autoloading .22 target pistol with a factory-installed bipod and a hand grip at the rear. It is built around the 10/22 action and should be a fun one to shoot, agreeably accurate though the 10/22 trigger is only fair. Ruger is also offering the SP101 double-action revolver in the new .327 Federal cartridge, holding six rounds where the .357 held only five. Three loadings are available: a low recoil 85-grain Hydra Shock Personal Defense, a 100-grain soft point, and a 115-grain Speer Gold Dot. I’m not sure if Mossberg began planning their newest rifle before or after the demise of the Winchester 94 or the advent of Hornady LeverEvolution .30-30 ammunition. Regardless, the traditionally styled lever rifle in .30-30 (and also .22 rimfire) incorporates the best features of the Marlin and Winchester designs, with a few touches of their own. One notable addition is a sliding thumb safety (similar to Mossberg shotguns) in addition to the hammer. This allows the shooter to use either or both, and to have the safety on while loading and unloading. The new Mossberg lever rifle is relatively inexpensive and should be a hit with value-minded hunters. Mossberg’s 817 bolt action in .17 HMR is now available with a tack-driving bull barrel and Weaver-style scope bases. Look for .22 Plinksters in pink and pink camo (another trend) and also a youth-sized .22 called the Half-Pint. Savage is offering a limited-edition Classic Model 110, marking the 50th anniversary of that grand rifle, and also a new Classic rimfire series. The original version of their ultimate varminter features a right-hand bolt and a left-side port, while the new version of this super-accurate rifle uses a detachable box magazine and a more conventional right bolt and right-side port. It is offered in a left-hand version, too. The new Savage Model 25 varminter is available in .223 and .204, with a retail price of about $500. Much to my sadness, the over/under combination gun has been dropped from the Savage line. I see eight variations listed for the ultra-accurate Savage Model 12, and they all include the new Target AccuTrigger, adjustable from 2-1/2 pounds all the way down to 6 ounces pull pressure. Poor triggers have long been the bane of .22 rimfires, but now, every one of Savage’s bolt-action rimfire rifles comes equipped with the excellent adjustable AccuTrigger. Yes, even the Savage Cub youth model comes with an AccuTrigger and also is available in pink. Speaking of trends, even Remington is now offering a “black rifle,” the moniker given AR-15-style .223 autoloaders. Perhaps to stress the hunting application, the R-15 Predator is not offered in black, only camo. It is available in .223 or .204. I suppose an AR-15-styled Remington really isn’t that big of a surprise. After all, the Remington group now includes Olympic Arms, DPMS Panther Arms, and Cobb Manufacturing, making it the largest manufacturer of AR-15-type rifles in the world. The Remington group is also in the process of buying Marlin and its subsidiary H&R (speaking of trends). Being left-handed myself, I appreciate the three new southpaw Remington Model 700s, including a youth rifle. Their model 597 autoloader .22 received a face lift with new stocks that include ambidextrous thumb holes and both blaze and pink camo finishes. Their Model Five now has a youth version, too. Also new is an ambidextrous thumb hole ShurShot stock for 870 and 11-87 shotguns. A new Model Seven Predator weighs just 7 pounds and is finished in Mossy Oak Brush. Remington claims the world’s most effective recoil pad in their SuperCell, which will be on many new guns and also offered as an accessory. Also new is Remington’s X-Mark Pro trigger on some Model 700 and Seven rifles. Sigarms has returned to the classic Sig-Sauer name with two new offerings—a 5.56 autoloading rifle and a modular P-250 autoloading pistol that allows the owner to change both caliber and size at will. With Sig’s reputation for quality, its new “black rifle” merits a look, too. Smith & Wesson’s purchase of Thompson/Center has already resulted in a new rifle by each, with several features in common. The S&W i-Bolt features a recoil reduction chamber, Tru-Set trigger, 60-degree bolt, flush sling mounts, box magazine, match grade T/C barrel and attached Weaver-style bases. Smith & Wesson also unveiled a new lineup of short-barreled, high-end revolvers, dubbed Night Guard. All are darkly finished and built on lightweight Scandium Alloy frames. Tritium front sights and Pachmayr Compact grips complete the package. Available in .357, .45 ACP, .44 Special and .44 Magnum, these guns include most of what you might ask for in a custom-built carry revolver. Thompson/Center has added a long-action version of the Icon rifle, WeatherShield black and also camo synthetic stocks for the short actions. The Icon features an adjustable trigger, 60-degree bolt lift, changeable bolt handles, integral Weaver-style bases, and an independent bolt lock that releases as the safety releases. Kimber is offering their lightweight (5 pound) Montana in .257 Roberts. Also new from Kimber is the smallest 1911-style .45 available today. Taurus is offering its Tracker revolver in the reintroduced 5mm rimfire as well as .22 WMR. Look for an ultra lightweight .41 Magnum Tracker at 24 ounces. Magnum Research has a new .22 Magnum rimfire autoloading rifle designed to solve the problems with magnum case rupture that have plagued others. The CheyTac .408 is a new idea in long-range rifles that may well displace the .50 as the go-to round for long-range military sniping. The ballistics are that impressive. This one should interest any long-range shooter who doesn’t mind paying top dollar for top performance. On the ammo side, Hornady’s continuing collaboration with Ruger has produced the .300 and .338 Ruger Compact Magnums. A few years ago, Hornady developed a method to safely get more velocity from almost all rifle cartridges and has sold it as Light Magnum and Heavy Magnum ammunition. Similar technology permits the .300 RCM and .338 RCM to exceed .300 and .338 Win Mag performance, not only with a much shorter case, but also from a 20-inch barrel. The shorter RCM cartridges are based on the still relatively new .375 Ruger case, which also fits short-action rifles. A new line of Hornady rifle bullets aptly named the Dangerous Game Series includes solids and expanding bullets. They feature extremely hard lead cores and copper-clad steel jackets and are available in 9.3x74R, .376 Steyr, .375 H&H & Ruger, .416 Rigby, .458 Win & Lott, .450/400 and .450 Nitro Express. I’m delighted to see Hornady LeverEvolution technology applied to .357 and .44 Magnum ammunition, with a 140-grain .357 and a 225-grain .44. The soft Flex-Tip nose lets you safely load these cartridges in tubular magazines and also increases the ballistic coefficient, which is certainly beneficial in a hunting handgun. Hornady also has applied LeverEvolution technology to the .32 Special, and the classic round is “special” again, driving a 165-grain Flex-Tip at 2,410 feet a second. They also make a new, highly accurate .22 WMR load with a 30-grain V-Max bullet leaving the muzzle at 2,200 ft/s. Hornady’s says their new muzzleloading sabot goes down the barrel 50 percent easier yet maintains top accuracy. For even easier loading, they have a new, full-diameter .50 jacketed bullet. At 350 grains, it features the pointed Flex-tip and a concave base to seal the bore. The company claims excellent accuracy for this one, too. Hornady has almost doubled its line of cartridge cases for reloading, and they have just released the seventh edition of their Handbook of Cartridge Reloading. Nosler has at least two outstanding new bullets to consider. First is a lead-free hunting bullet made from their 210 Alloy. This hollow cavity, polymer-tipped .30 projectile is available in 150 or 180 grains. Second is a line of big, dangerous-game solids in .375, .416, and .458. Check out the Nosler #6 Reloading Guide for more. Remington’s new I, II, and III Power Level ammunition offers exceptional flexibility in a factory cartridge. For example, the .300 Ultra Magnum III is a full load. The II duplicates the recoil and range of a .300 Winchester Magnum, and the I matches up with a .30-06. Eley, maker of Tenex, the world’s most accurate .22 LR target ammo, has a new Team cartridge that comes close to Tenex in performance but at a lower price. You might be surprised by how well your .22 shoots these premium rimfire cartridges. Winchester has a new, reduced-recoil load for the .460 S&W, a 250-grain jacketed hollow point. At 1,450 ft/s and half the recoil of full-potency loads, this new ammo is just right for practice as well as many hunting applications. Winchester also offers a 2008 collector’s series Theodore Roosevelt in .45 Colt, .405 and .30-30. Also new is Winchester’s line of Safari Loads, using Nosler’s new solids and the Partition bullets. Winchester is loading Nosler E-Tip bullets in some ammo. Barnes has expanded their line with the Tipped TSX, basically their “X” bullet with a polymer tip. Look for new MRX bullets, too. These use a tungsten-based core as well as a polymer-tipped hollow point. Even their top muzzleloader bullet now has a polymer tip. They also have added a 26-grain in .204 and a 50-grain .224 in the composite core Grenade varmint bullet line. Black Hills is the only company offering loaded cartridges with Grenades in .223, .22-250, and .243. In sighting equipment, Bushnell now offers the widest magnification range in a variable power riflescope, with their Elite 6500 Series at 2.5-16x. Before, a hunter might have settled for a 2-7x variable to get the 42-foot field of view at 2 power. But the new Bushnell gives 42 feet at 2.5x, and the same scope can crank up to 16x. It’s the one scope for brush and bean field. Burris’ new LRS series scopes are available with Electro-Dot reticles and Digital Dimmer small-profile controls. Of special interest to me is the 3-12x handgun scope with both Ballistic Plex and Electro-Dot reticle. Burris has also introduced a tiny FastFire open red dot reflex sight that mounts to a shotgun using a thin plate installed at the juncture of stock and action. It’s called the SpeedBead, and being so close to the shooter’s eye, it provides a tremendous field of view. Trijicon is now offering their 4x ACOG military sight to the shooting public. They also have a new 6x ACOG, though primarily for larger weaponry. Trijicon moved strongly into the hunting market with conventional Accupoint riflescopes, using their tritium/fiber triangular point. For this year, they have introduced conventional cross-hair models that still have the battery-free illumination. The new Trijicon RX30 reflex (red dot) sight uses fiber optics and tritium (no batteries) and has a great field of view. 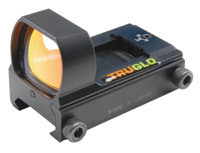 TruGlo has a new, inexpensive, dual-color, multi-reticle open red-dot sight. Another new dual-color TruGlo red dot has an integrated Remington mount. All come in black or camo. Their new Tru-Brite line offers dual-color illuminated reticles in 3-9x, 3-12x, and 4-16x riflescopes; the entire bullet-drop compensating reticle is illuminated. Also new are combination tritium and fiber optic front sights for shotguns and AR-15s, as well as tritium handgun sights.